While most of the consumer audio world has turned its focus to docks and wireless systems, Audioengine remains steadfast in its commitment to the standard two-piece, stereo, bookshelf-style speaker setup. 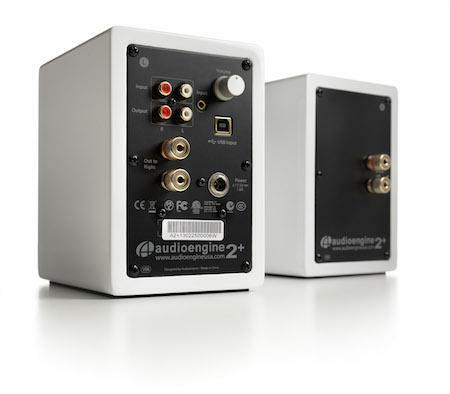 When we reviewed the original Audioengine 2, no longer in production, we loved its flat response and no-nonsense design. The $249 Audioengine 2+ (nicknamed the A2+) is the update to the A2 and at first glance, it seems nearly identical to its predecessor. The addition of a built-in USB digital-to-analog converter (DAC) let the speakers bypass your computer’s lowly analog output entirely, offering a purer audio signal that works well with the A2+’s audiophile-friendly drivers. The front face of each 6-by-4-by-5.3-inch (HWD) speaker features a 2.8-inch Kevlar woofer and a 3/4-inch silk dome tweeter. The back panel of the left speaker houses the output to the right satellite, an RCA input, an RCA output, a 3.5mm input, a USB port, and the connection for the included power supply. The back of the right speaker only holds the connector for the left one. Each speaker has a threaded insert on the bottom panel for wall mounting, but it doesn’t come with any mounting hardware. While there are plenty of subtle upgrades between the A2 and the current A2+, the most obvious upgrade is the USB port for the built-in DAC. Connecting to your computer’s USB port and using it as the audio output instead of the 3.5mm audio output means you don’t have to rely on your computer’s internal DAC, which most likely is not that impressive. The A2+ handles all the digital-to-analog converting itself, and the result is a much purer listening experience. Other than the DAC, you can now use the audio outputs on the left speaker’s back panel to connect a subwoofer or stream wirelessly with the optional $150 Audioengine W3 wireless adapter. The W3 is a two-part, proprietary wireless USB adapter, and doesn’t add a wireless standard like Bluetooth or AirPlay to the speakers. The A2+ comes with a USB cable, a link cable for the left and right speakers, a 3.5mm aux cable for playback from mobile devices, and the power supply, all of which seem like higher quality upgrades of the cables included with the A2. If you plan on using the speakers on a desktop, you should check out the $34 Audioengine desktop speaker stands. They angle the drivers up to your ears so the sound isn’t aimed at your mid-section. Without them, it would take a lot of symmetrical book-stacking to get the speakers to identical heights without angling them. It’s worth noting that Audioengine offers a 30-day trial period for the A2+ if you order from its website. Not much has changed in terms of the A2+’s sound signature versus the original speakers. It sounds much like the A2, which means a marked focus on the mids and highs. Low frequencies are reproduced cleanly and dutifully, but sub-bass is generally left out of the equation. That’s why there’s a subwoofer output, for those who wish to dial in some added deep low-end rumble. Despite the lack of emphasis on rumble, the A2+ doesn’t sound thin at all on tracks with tremendous sub-bass content, like The Knife’s “Silent Shout.” The speakers deliver plenty of low and low-mid information, and they can get quite loud. 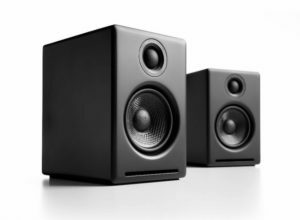 They put out much more sound in that range than what the drivers can handle in deep bass territory, however, so caution is encouraged at top volumes on both your sound source and the speakers themselves. These variables shift from sound source to sound source, and also depend on whether you use the 3.5mm input or the USB DAC. The DAC allows higher quality files to shine in their less compressed, higher bitrate, more dynamic glory. Bill Callahan’s “Drover” is delivered with almost zero coloration. His baritone vocals sound wonderfully resonant through the woofers without a sense of boosting the low end, and receive enough treble edge to remain clear and well-defined alongside the guitar strums. The drums, which on bass-heavy speakers often sound unnatural, here lack almost any semblance of low end; the focus is on their attack, which sits squarely in the low-mids and mids and doesn’t compete with the vocals for the spotlight. It’s on tracks like Jay-Z and Kanye West’s “No Church in the Wild” that deep bass response is most missed. The kick drum loop attacks have a nice snap to them, but the low-end sustain on the loop is subtle at best, and the sub-bass synth hits offer no sense of their deep profile. Again, this is less a criticism than a heads-up: If you listen to tracks that have lots of sub-bass content, you’re probably going to want Audioengine’s subwoofer to go with this system. Otherwise, you’re left with an excellent flat-response-style stereo pair that just doesn’t reach down into the sub-bass realm. Classical tracks, like John Adams’ “The Chairman Dances,” sound fantastic through the A2+. These are the types of recordings that benefit from dynamic, clear, unexaggerated frequency responses that give the lower register strings plenty of chance to shine. They don’t need the sub-bass presence that most modern pop and hip hop mixes want. Instead, most of their bass content resides in lows and low-mids, of which the A2+ offers aplenty. The mids and highs on this track shine brilliantly as well, with the woodblock hits seemingly floating in a space of their own, giving them the room to breath that other speakers often deny. If you’re looking for flat response on a sub-$300 budget, you’ve found it. If it’s more bass response you crave, you can try adding the sub to this system, or just check out speakers that come with a sub, like the Editors’ Choice Harman Kardon SoundSticks III$168.25 at Amazon. The pricier Audioengine 5+£325.00 at Amazon brings more bass to the table, but in a subtle manner. The 2+ speakers would make a great small pair of monitors for a modest home studio set-up, and it’s worth contrasting their sound signature with a pair like the M-Audio BX5 D2 so you have a better idea what to expect from each. If you’re looking for less expensive PC speakers, consider the Editors’ Choice Edifier Exclaim e10£79.99 at Amazon. Audioengine may not change the recipe much, but that’s what we like about them—the A2+ brings the clarity and dynamics audiophiles crave to a relatively affordable realm audiophile gear rarely visits.